The Top 10 Holiday Experiences in DFW this Winter! An award winning holiday tradition! 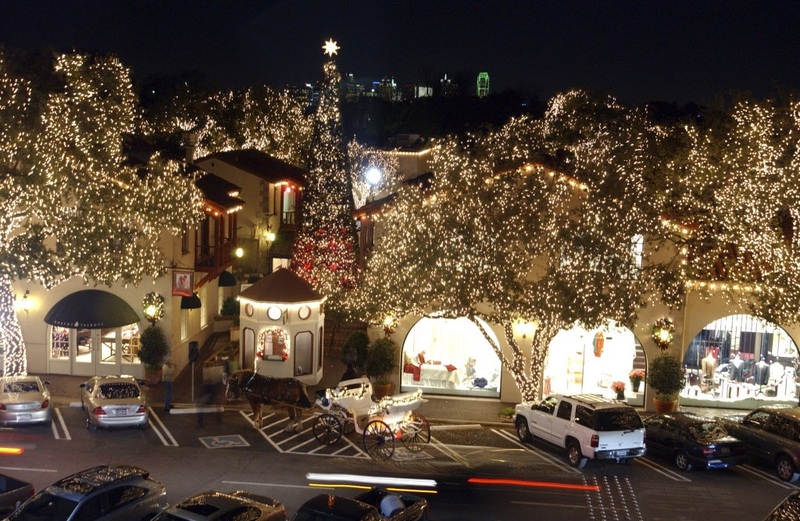 Threejays Carriages is the only carriage ride service to leave from Highland Park Village, and provides a far superior experience to enjoy the beautiful Christmas lights in the beautiful estates of Highland Park, Tx. Your family and significant others will feel like they have just stepped into an enchanting, nostalgic winter wonderland with the sound of horses' hooves, sleigh bells, holiday carols. While in Highland Park Village then don't forget to eat at some of the amazing restaurants like Bistro 31, Mi Cocina, and Cafe Pacific. Once you step on the ice at the Galleria and look up at the 95 ft Christmas tree, you'll discover it's truly the most unique and coolest ice skating experience around. With hundred's of stores, shoppers and restaurants, you will find yourself in the center of one of Dallas' greatest Christmas venues. So, take a lesson, have a private party or just go for a spin, but make sure to check out the Dallas Galleria & Ice Rink. Christmas seems to make people feel the need to be a bit more giving than they do the rest of the year, so if this is you then you may find the Dallas Stewpot to fit your niche. As an urban pioneer, responding to the unmet and emerging needs of the homeless and at-risk of Dallas for more than 40 years. The Stewpot offers a safe haven for homeless and at-risk individuals of Dallas, providing resources for basic survival needs, as well as opportunities to start a new life. A true Dallas theatrical classic, the Texas Ballet Theater's The Nutcracker is truly a performance to be seen. Wether you find yourself in Dallas or Fort Worth this winter, you can find them performing at both the Winspear Opera House and Bass Hall. So, come with Clara to a dreamland of heroic battles and breathtaking beauty in a holiday classic for all ages. One of "The South's Best Holiday Experiences" - Southern Living Magazine - Celebrate the most wonderful time of the year with Holiday at the Dallas Arboretum, featuring The 12 Days of Christmas outdoor exhibit. The Arboretum will be open for special lighted nighttime showings throughout December. You will also find a variety of holiday music provided throughout the garden; as well as seasonal sweet, savory treats and hot beverages available for purchase. Our landmark department store residing in Downtown Dallas never disappoints. With interactive window displays, hot chocolate and Christmas decor galore, and the extraordinarily famous Christmas Book. Make sure to make this a destination for your family's Christmas shopping, or at least lunching, this year. Find your inner-child with one of the fantastic classics like Home Alone in Concert and How the Grinch Stole Christmas - The Musical. Wether a major production or a children's play, Christmas in Dallas always has an abundance of talent to be seen. Happy Holidays, Merry Christmas, and Happy New Year, from my family to yours! From Surbhi and I both we wish you a blessed holiday season, with memories for a lifetime.